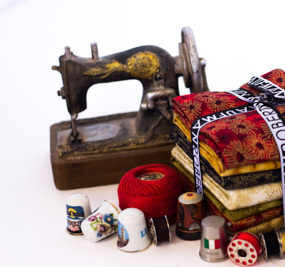 There’s a huge range of tools and equipment available for quilters today but in actual fact you can start quilting with just a few basic items. One of the best time saving tools available to quilters is the rotary cutter. Used in conjunction with a self-healing mat and quilting ruler they make cutting fabric quick, easy and precise. They come in various sizes but most people start with a 45″ blade. However, if you’re on a budget a good quality pair of fabric scissors will also do the job. Historically quilters used whatever fabrics they had available to them, including linen and clothing that was no longer able to be used for its primary purpose. 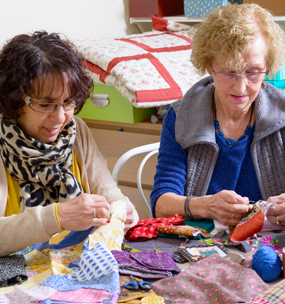 Today, most quilters use 100% cotton quilting fabric and we are spoiled for choice with the huge range of colours, patterns and styles available to us. Over time you’re sure to build up a fabric stash (collection) as you find fabrics you ‘just have to have’. * Only buy what you need. Start with a project in mind and a good idea of the quantity and variety (eg light/medium/ dark) of fabric you need for that project. * Buy the best quality fabric you can afford as your quilts will last longer. 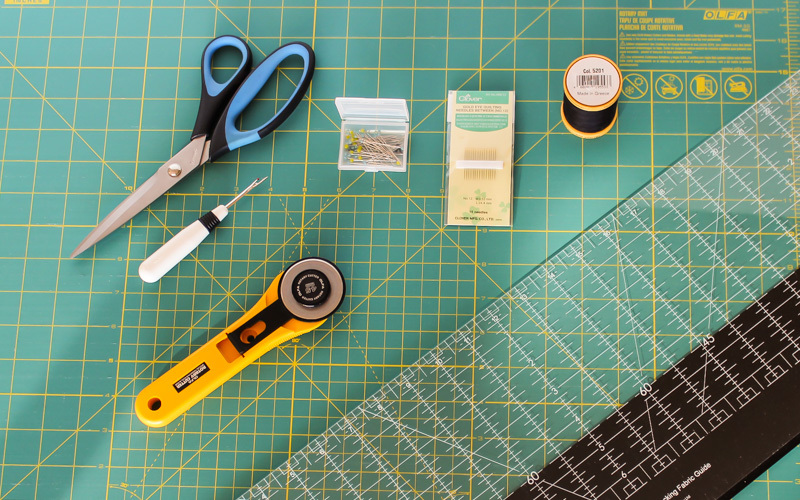 * If you really want to have some fabric on hand for when inspiration strikes, or you’re an impulse buyer, pre-cuts can be a good option to start building your stash. 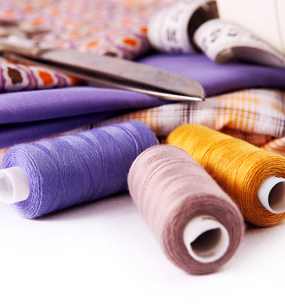 Pre-cuts are fabrics that have been pre-cut into specific sizes, eg fat quarters. Other types of fabric can also be used in quilts and it is completely up to you what types of fabric you use. Here are some more suggestions to consider when choosing fabrics. * Some fabrics may need a stabiliser behind them to make them easier to work with (eg to reduce stretching, fraying or slippage). 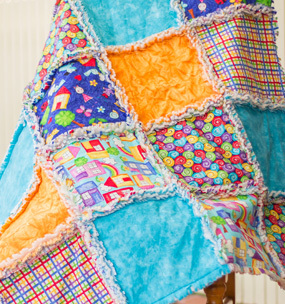 * When piecing together a quilt top it will be easier if you use fabrics of a similar weight and thickness. Also known as batting, wadding is the fleecy fabric that goes between your quilt top and back, and provides the warmth of your quilt. It’s not essential but is used in most quilts. Wadding comes in various thicknesses and is made from various types and blends of fibre (eg cotton, polyester, cotton/polyester blends, bamboo). There are a myriad of threads available, including cotton, polyester, rayon, silk, nylon and metallic, in various weights (thicknesses) and colours. Some threads are for hand quilting only, others can be used for either hand or machine piecing and quilting. When you’re starting out it’s recommended to have a light (white or cream), medium (eg mid-grey) and dark (black) thread as these can blend with most fabric colours. As you progress and become more confident you are likely to add more colours to your collection and may experiment with different types of thread. You can use standard pins when piecing your quilt top but I personally prefer fine patchwork pins. They move through the fabric easily, don’t leave big holes in your fabric and there is less risk of breaking your sewing machine needle on them if you accidentally sew over them. For quilting I like to use curved safety pins to secure my three layers together. Be careful when buying them though as some of the cheaper brands contain pins that have blunt points or rough sections that can cause snags and tears in your fabrics. Hand quilting needles come in various lengths and are specifically designed for hand quilting. I use a number nine embroidery needle for stitching down the binding on the back of my quilts. The type of sewing machine needle you use will depend on the thickness of your fabric and thread. * Self-healing mats – these protect your cutting surface, have cutting grids marked on them, come in various shapes and sizes, and generally last a long time if looked after. A mat with a 24″ grid gives you good cutting flexibility when starting out. * Quilting rulers – rulers are generally acrylic and come in all shapes and sizes. They help to ensure straight cutting with your rotary cutter. A 24″ x 6″ rectangular ruler, or similar, will give you flexibility for cutting a range of fabric sizes and pieces to start with. * Sewing machine – this is not essential if you are happy and able to hand quilt. The most common stitch used in quilting is straight stitch so you don’t need a fancy machine. Look for a machine where you can drop your feed dogs and attach a darning foot for free motion quilting. The depth of the throat of the machine will also have an impact on the size of quilt you can comfortably quilt at home. * Seam ripper – for fixing mistakes. * Good light – for evening work. * Bandaids – so you don’t get blood on your quilt if you stick yourself with a pin! * Patterns – there is a huge range of traditional quilt block patterns available for free on the internet, or draft your own with pencil and paper. Of course, there are plenty of patterns available to buy as well.